Stephen Geoffrey, style 602: Up the style quotient in an ivory tuxedo jacket with a sleek, satin notched lapel. Our featured tux (pictured above) is the perfect choice for a sophisticated, warm weather affair. Customize the look with coordinating pleated trousers in ivory or black. Finding the ideal formal wear doesn’t have to be scary for the grooms party. In fact, we promise it will be painless. We can make that vow because New York Bride & Groom offers the guys their own tuxedo rental department as well as their own shop attendants to help simplify everything. Our experienced consultants will help everyone assemble their suits and make sure that the correct measurements are taken and the orders are properly placed. Best of all, we stock samples of every suit so you can feel the material and see the true color. There’s no guesswork like with most other salons, where you’re only option is ordering from a catalog or an online gallery. At the most basic level, his attire should be appropriate for your venue and fit with the overall vibe of the wedding. If your wedding is in the daytime or outdoors, it can be a bit more casual (think: lighter-colored suits made of fabrics like seersucker or khaki). If it’s an evening affair in a ballroom or swanky hotel, go with either a dark, well-tailored suit or for black-tie attire (a tux). Need to step it up one more notch? Suited for an extra-luxe venue, white-tie is the ultimate in formalwear. This means a black tailcoat, white shirt and white bow tie. Michael Kors, style 991: The Ultra Slim Berkeley offers a modern approach to a classic tuxedo style. Its trim and tapered fit and lightweight Venetian Super 130s wool provide the ultimate fit and feel in a tux. Details like the grosgrain notch lapel, matching buttons, and grosgrain-trimmed double besom pockets complete the look. Pair the ensemble with matching ultra slim fit pants and a matching wool vest for a 3-piece look. Also available in slim fit styling to accommodate all the members of your party. It’s a very good day when you can take care of a major wedding day detail, find great-looking outfits and save money simultaneously. If 5 or more tuxedos are rented for your wedding, we’ll throw in another free of charge. This guarantees your grooms party will look outstanding, crosses an item off your list and saves money for the groom. Send all the guys in your wedding to NYB&G and we’ll make sure everything gets handled. Is the bride’s dress ivory, or is it white? Although the grooms may not know exactly what they are looking for when they walk into Street Tuxedo (Nashville, TN), Mark says the brides who accompany them usually have a pretty good idea themselves! Whether the groom is going for a traditional look or a trendier adaptation, one of the first questions Mark will ask is whether the bride’s gown is ivory or white. This helps determine what color shirts the men in the wedding party will wear. Tony Bowls, style 301: The Grey Portofino tuxedo is a fashion-forward choice for a sophisticated affair. It’s tailored in a soft, super-fine wool blend. Trend-right design details, including a one-button closure and contrasting black satin peak lapels, add to the clean lines and tailored look. Pair with matching flat front, modern slim fit pants. 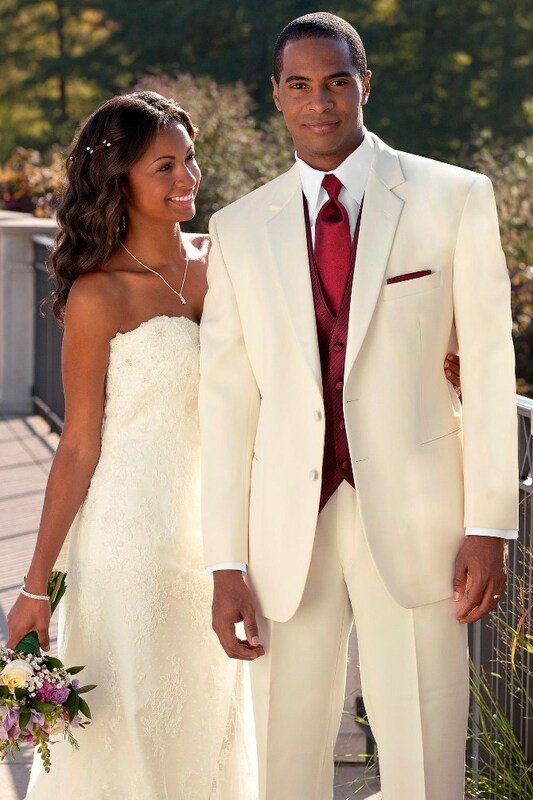 When it comes to wedding attire, New York Bride & Groom has the ideal garments for the girls and the guys. We truly are your one-stop wedding salon stop. Our inspired designs and popular pricing will offer you a beautiful designer look for less than you expected. Our “No Appointment Needed” policy means you can browse our wide selection of wedding dresses, bridesmaid dresses and rental tuxedos at your convenience. Stop by today and let us help you put together your wedding ensemble in a fun, stress-free and no-pressure atmosphere.